Non-league Bashley FC have written to the Football Association requesting their FA Cup first-round qualifying match against Gosport Borough is replayed after a clear goal was missed by referee Will Bull. With the teams level at 2-2, Bashley 'scored' late on after James Stokoe struck from close range, but in frustration the Gosport keeper kicked the ball through the side netting. And, having missed the ball going in, referee Bull then awarded a corner. 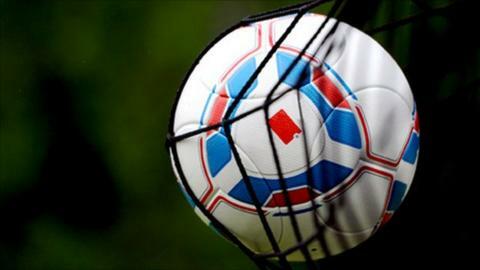 "We feel cheated," Bashley vice-chairman Tim Titheridge told BBC Sport. The incident was also missed by the assistant referee and Bashley went on to lose 3-2 after extra time. It is a mistake Titheridge believes has cost them up to £10,000. "We don't blame the referee for not seeing it, but we do blame the Gosport players for not owning up," he said. Bashley have now written to the FA's competitions department requesting a replay of their replay. "We have also written to Gosport asking them to write to the FA, but we do not expect anything to happen," he added. Bull was being assessed during the game and was told of his error after the final whistle. "He was horrified when the assessor told him he got it wrong," said Titheridge. Titheridge added the assistant referee had been told of a hole in the side netting at half time but did nothing about it. He added: "A number of Gosport players, management staff, supporters and officials admitted that a goal should have been given, expressed sympathy and some even apologised to members of our club." Gosport manager Alex Pike said seven of his players had admitted it was a goal, but did not blame them for not owning up. "I could not see what happened," Pike told BBC Sport. "But after the game I asked my players what had gone on and two said they didn't know, two said it wasn't a goal and seven said it was a goal. The indication is it was a goal. "There is a lot of prize money at stake and I would not expect my players to own up, these things happen in football. Did you see Roy Carrolll or the Manchester United players own up against Tottenham? No." Pike also said he would not be willing to replay the game. "I attach no blame to my players. I can't speak on behalf of the club, but if they asked me I would tell them I am not willing to re-play the game," he said. "I don't agree that it is an extraordinary circumstance, this sort of thing happens in football all the time. Did you not watch the World Cup game between Germany and England when Frank Lampard scored? "A replay would be a futile gesture. What would they do? They are only writing to the FA because they ended up losing. They had the same opportunity to score in extra-time as us."